Isabelle Kallenberg is a first year Master's student of Dr. Joe Giambrone in Poultry Sciences at Auburn University. 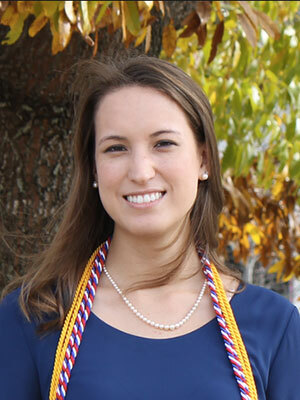 An Auburn native, she also completed her Bachelor of Science in Microbial, Cellular, and Molecular Biology and her Bachelor of Arts in French at Auburn University. In her spare time, Isabelle enjoys volunteering at her local hospital and in underserved communities abroad. Her research interests include microbiology and molecular virology applied to human medicine and she plans to apply to medical school in the summer of 2017. Isabelle hopes to one day combine her passions for travel, language, and medicine by working with Doctors Without Borders (Médecins Sans Frontières). Infectious Bronchitis Virus (IBV) is an economically important pathogen in the poultry industry. The IBV-specific immune response is initiated in the host by activating pathogen associated molecular pattern (PAMP) receptors during virus infection. We hypothesize that PAMP receptors are important in the control of IBV in chickens.